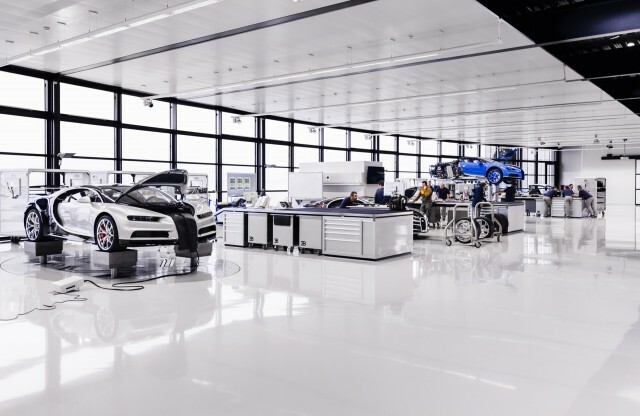 Chiron production is well underway at Bugatti’s plant in Molsheim, France, and the first examples are due to be delivered to customers in the first quarter of 2017. Bugatti plans to build the cars at a rate of roughly 70 per year, and the company has already confirmed that just 500 will be built in total, including all special editions. No two examples will be the same because of the long list of options available to the well-heeled buyers. Bugatti has a standard list of options that includes 23 colors, eight carbon varieties, 31 leather hues, 8 Alcantara colors, 18 carpet styles, 11 belt colors, and 30 types of stitching. However, buyers can also make their own requests. Once the requirements are locked in, all of the parts required for the build are ordered. One month before the start of production, the body shell is assembled with the monocoque and chassis substructure for the first time to ensure that everything fits together perfectly. Each part is assigned a kit number and is then transferred to the paint shop. It takes about three weeks to apply the various coats of paint. In the case of visible carbon fiber, six layers are required. For the top coat, up to eight layers may be needed depending on whether the finish that has been ordered is matte, metallic or pearlescent. The process is so time-consuming because all layers are applied by hand and each individual coat needs to be sanded down and polished before work can start on the next coat. The next stage is to assemble the car. One Chiron requires 20 people working mostly by hand to assemble its roughly 1,800 parts. During this process the car’s quad-turbocharged 8.0-liter W-16 is fired up and dyno testing is completed. The final stage is some testing in the real-world before one more check is done and the 1,480-horsepower beast sent on its way. Each is a masterpiece that when combined with the performance on offer easily justifies the 2.4 million euros ($2.56 million) price tag. The Chiron is ultimate luxury, and no other car, apart from perhaps its predecessor, can be compared. According to Bugatti, on average six months will pass between the start of production and when the car is finally delivered. Existing customers and especially those that own multiple Bugattis have priority over those new to the brand. And one loyal fan, believed to be a member of Saudi Arabia’s Saud ruling family, has already taken delivery of a Chiron. However, his is the pre-production example shown at the car’s 2016 Geneva auto show debut.